Reader: I have a MAJOR dilemma! 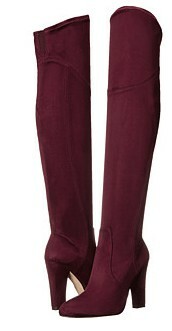 I have been on a wine obsession all season and bought wine Stuart Weitzman highland boots and now I have buyers remorse! Help! How can I make this investment work?! Wine is a tricky color. It is a blend of red, purple, and brown so trying to match it to colors can be very hard. It is not impossible though! The color is not as daunting as it may seem so do not worry, I will not let an $800 investment go to waste. You will be rocking those beauties like a pro fashionista! Remember that at the end of the day, even though they have an interesting color they are still just over-the-knee boots. Take the pressure off them and stop thinking about the color. So when it comes to styling, wear them with any piece you would normally wear over-the-knee boots with. For example jeans, dresses, skirts, etc. They will add such a great pop to an outfit! When it comes to picking colors to wear with the boots— stay neutral. You have a MAJOR pop of color. That’s all you need. Pair it black, grays, tans, and winter white. If you really need some color, then choose subtle colors such as blush pink, khaki green, or navy. They compliment each other, but the wine is still the dominant color. You never want the colors you’re wearing to be competing with each other. I put together a few looks so that you can see my tips in full effect! If you are in the market for wine colored boots, here are the Staurt Weitzman boots mentioned as well as a more affordable option! Check out previous reader questions answered here!